I've been such a horrible blogger lately! Here's my temporary new header. I was so sick of the old one that I had to get this one up even though I'm not quite satisfied with it yet. Here you go. In other news, Brooke got married yesterday! Her wedding was lovely, and I miss her already! I'm still not used to the whole some-of-my-friends-are-married thing. It's been almost a year since Emily got married and two weeks since Laura got married, but I still can't wrap my mind around it. When did we get this OLD!? Girls about to hit the town for Laura's bachelorette party! Girls on the dance floor at Laura's wedding! Doesn't she look gorgeous? After some late night swimming at Brooke's bachelorette party! At the bowling alley the night before Brooke's big day! Here are some pics from all the bridal festivities over the last couple of weeks! Sorry these are so blurry! I pulled them from Facebook! I will post pics of Brooke's wedding once they go up on Facebook! She looked amazing, and the day was beautiful! You know one crazy thing I was reminded of over Brooke's wedding weekend? 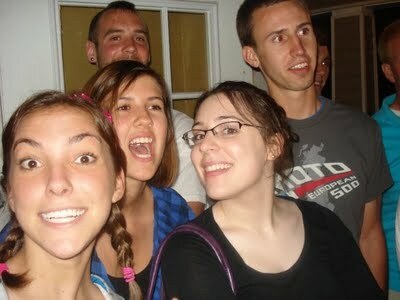 This photo was taken in May 2009, nine months before John and Brooke started dating! Brooke, Lindsay, Josh, Kristina (not pictured), and I drove down to Nashville for a Hillsong concert, but we stopped in Bowling Green (where Brooke and Kristina go went to college) for one night, and this pic was snapped. And lookee who's in the background! John Schreiner. Brooke's future husband. So if you are on the lookout for a husband, go click through old FB pics because he may just be lurking in the background. p.s. Do you like my ridiculous attempt to get the good left side of my face in the foreground of this picture? Sometimes I go overboard in that attempt.